When you buy a World Vineyard Series wine kit you will get free two wine glasses. Click here to see all of the featured wine kits. The Italian Primitivo will be arriving at The Vineyard this week. If you ordered this exciting kit you will be receiving a note when it arrives. This is the original Zinfandel from the Puglia region in Italy and is a full red wine to add to your cellar. The Region: Puglia forms a long narrow peninsula, making up the heel of the boot of Italy. Dry and warm, it basks in the Mediterranean sun, and has a long, rich history of grape growing. The Appenine mountains give an excellent range of elevations and soil types, and it produces more wine than any other region in Italy, specializing in intensely ripe grapes from its hillsides. The Wine: Italian Primitivo is medium red in colour veering to brick, rich, and concentrated, exuding aromas of blackberry, plums, tobacco, prunes and red cherries, with the Italian signature of firm tannins and a long, gripping finish with notes of vanilla and toast. Like most Italian reds it retains acidity to balance fruit character and marry well with food. If you missed the pre-order on this wine, do not worry we were able to secure a few extras. Please contact either store if you would like an Italian Primitivo. We also have a very few extras of the other great Limited Edition wine kits: click here description and wine details. Our January meetings was a real treat, we had a couple fellows give the South Vineyard Wine Guild a very interesting and informative presentation on Mead. Colin and Nathan Ryan have started a meadery in Water Valley. They are using honey from their family owned and operated honey business, Ryan's Honey, and fermenting some wonderful meads. 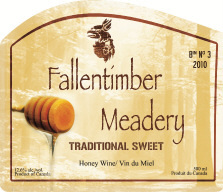 Their meadery is called Fallentimber Meadery. Mead is one of the oldest beverages and yet we here in Western Canada we know ve ry little about it. My expectation was a sweet dessert type wine. But the Ryan brothers are certainly debunking that 'myth'. They brought samples of their meads,Traditional, Tradition Dry, Traditional Sweet , Cinnamon and Saskatoon berry-rhubarb Melomel which were all excellent. Proving that mead is a wine to be enjoyed by its self and/or with a meal. And it is not too sweet, but very much along the same sweetnes levels as most white wines. The Fallentimber Meadry is about 50 minutes north and west of Calgary. The onsite store is open to the public most weekends. Our South Wine Guilld meets on the third Tuesday of each month. If you wish to join us, please contact Henry or Tom at the South store 403-258-1580. Beer enthusiasts and beer brewers make this is a large and very active local club. They meet on the first Wednesday of each month at the Wild Rose Brewery. February 22 - 26 is their 3rd Annual Cowtown Homebrew Roundup. They welcome entries of beer, mead and cider from all individuals and clubs. Last year they received more than 250 entries that came all the way from Vancouver Island to Newfoundland, and they hope to see even more this year! The Vineyard is very pleased to link to a great new web page called, The Unreserved. This is a fantastic gathering place for all the wine community. You will find great information on wine, drink, wine making, cooking with wine and just about everything to do with the wine lifestyle.